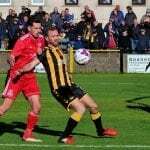 Talbot’s unbeaten run came to a tame end as they drew a blank at home against 10 man Glenafton. 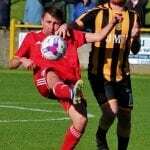 The first chance of the afternoon came Glenafton’s way in the 7th minute. McCann burst forward into the area & slid a shot just wide of the right post. Twelve minutes in & McCracken lost out in a 50/50 to Dallas whose run towards the area was halted by McCracken’s foul; conceding a free kick just outside the area. MCAUSLAND struck it & gave Leishman no chance as he whipped it over the wall & into the net off the underside of the bar. Two minutes later the Glens won a free kick in an almost identical position when McDowall floored Dallas. McDowall received a caution for the challenge but McAusland couldn’t repeat his earlier set-piece & this time fired it well over the bar. Talbot’s first meaningful attack came in the 16th minute when Glasgow surged through the centre before releasing it out to McIlroy on the left. He carried it into the area where his low cross was deflected behind for a corner. Shankland hoisted the corner into the centre where McGarrity gathered it under pressure. The visitors were forced into a change in the 18th minute. McChesney limping off the pitch to be replaced by Frye. Glasgow was denied the equaliser in the 20th minute thanks to a fine save from McGarrity. Glasgow latched onto a headed clearance & arrowed a drive from 25 yards that was flying inside the right post until McGarrity dived across to push it wide. McAusland’s pace caused Talbot problems in the 24th minute. He charged out from the back & raced deep into the Talbot half before sliding it to Moore on the left of the penalty area. His shot at goal was deflected into the air before finally being cleared. 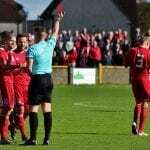 Cairns talked himself into the ref’s book in the 27th minute for chirping at the referee and four minutes later received his marching orders when he tripped Hyslop outside the penalty area. Tucker now made a change with McDowall leaving the field to be replaced by Armstrong. Shankland lifted the free kick over the wall & on target but it lacked the power to seriously trouble McGarrity who gathered to his right. 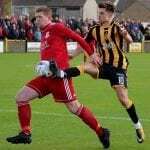 Talbot were struggling to make the extra man count & the game meandered on towards half time with Glenafton content to sit in & defend their lead. In the closing stages of the half Talbot produced a couple of promising attacks. In the 43rd min Lyle lifted a ball up the line to find Stephen Wilson. He beat Murphy & lifted a cross into the centre where Hyslop headed on target but it lacked the power to test McGarrity. As the half move into added time Shankland played it into McIlroy on the left of the area & his shot at goal was deflected just wide off McAusland. 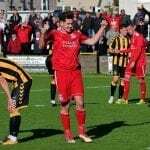 Glenafton successfully defended the resulting corner to go in ahead at the interval. Talbot came out the traps quickly at the start of the 2nd half carving out a chance within a minute of the re-start. Glasgow ran at the defence before sliding it out to Stephen Wilson on the right. He knocked it low into the near post where McIlroy side-footed it on target but straight at McGarrity. A minute later Talbot won a corner down the left. 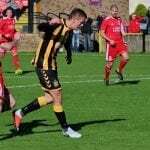 McGarrity was unable to gather Shankland’s cross under pressure from Hyslop & the ball came out to Pope who hooked a shot over the bar from 12 yards. McCracken had a half chance to get Talbot back on terms in the 48th minute. Talbot won a free kick out on the right touchline which Harvey angled into the area. McCracken met it unchallenged but got his header all wrong & sent it well wide of target. 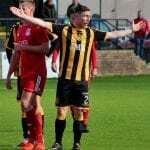 With Glenafton sitting deep it was all Talbot but the Glens defence were giving little away. Talbot did test McGarrity in the 55th minute when Glasgow laid the ball back to Shankland on the left. He swept a cross over beyond the back post where Stephen Wilson bulleted a header on goal that McGarrity turned round his left post. Stephen Wilson looked a gift horse in the mouth in the 57th min when he passed up a golden chance to level. McGarrity bowled the ball out to Murphy & the stand in left-back lost the ball when he tried to take on Wilson. He ran on into the box but with only the keeper to beat he fired a shot straight into the midriff of the advancing McGarrity. Glenafton made their 2nd change in the 59th minute with Marlow replacing Murphy. Moore received a caution in the 63rd minute for a late challenge on Hyslop. Tucker now made his 2nd change with Kemp coming on for McIlroy. A minute later Dallas also received a yellow card for a trip on Hyslop. The Glens completed their substitutions in the 69th minute when Orsi replaced Dallas. Talbot’s next effort at goal came in the 72nd minute when Shankland cut in off the left touchline & fired just over the bar from 20 yards. This proved to be his last involvement as he was subbed soon after & replaced by Graham Wilson. The 2nd half had been all Talbot but without the Bot being able to create many clear cut chances. Glasgow had a half chance in the 76th minute when the ball came to him on the left of the penalty area but his shot at goal took a deflection on its way through, taking the sting out of it & McGarrity made a comfortable save. McGarrity hadn’t put a foot wrong but made his one & only error in the 77th minute when he allowed a high cross to slip out his hands & over the bar for a corner. Frye took one for the team when cautioned in the 79th minute when he cynically took out Glasgow as he raced up field. As the game entered the final stages Talbot were piling men forward but a combination of resolute defending & a lack of quality in the final third was keeping the Glens lead intact. With four minutes remaining Talbot came close when Stephen Wilson headed Pope’s cross back across goal. Hesitant defending from the Glens saw Glasgow able to run onto the loose ball on the 6-yard line only to see his effort at goal deflected over the bar. Talbot fans knew it wasn’t going to be our afternoon in the 88th minute. Glasgow lifted the ball over to Stephen Wilson on the right who laid it back into the feet of Kemp. He hammered a shot from 20 yards but McGarrity was in the right spot to tip it over the bar. A disappointing afternoon for Talbot who saw plenty of the ball but couldn’t find a way past a determined defence & in form keeper. 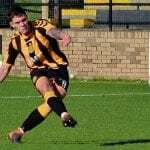 Next up for Talbot it is a trip to Newlandsfield next Sunday to face Lesmahagow in the Sectional cup final.